The above bold face items were two of the memory items required in the Air Force's undergraduate pilot training program while in the T-37 phase of instruction. The first is the spin recovery, and the second is the ejection sequence. The course ran for about a year and successful completion would result in the award of silver wings and the aeronautical rating of pilot. Bold face memory items were required to be committed to memory and recalled verbatim. Every morning, a briefing was conducted to go over items pertaining to the day's flying. One of the segments of the briefing was known as the "stand up". A designated instructor would present an emergency scenario and then call upon a student to stand and verbally walk though all the steps required to resolve the emergency. Should the event require the use of a memory item, the student was expected to recite the bold faced item perfectly as a first step. Incorrect recitation would be followed by a command of "sit down". This meant that the student was grounded for the day. This morning dog and pony show probably induced more stress in the students than would an actual emergency in the aircraft, and came to be widely hated by all. Worked the second time with a lot more adrenaline in my system. 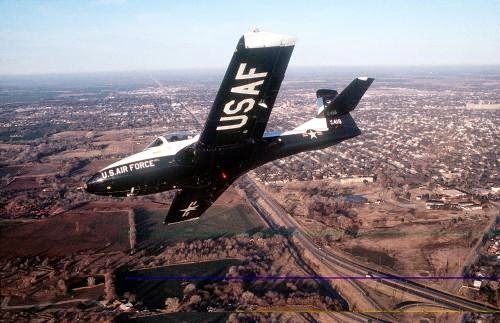 I am looking for video of the T-37 from the cockpit in flight, preferably during an aileron roll, to publicize a book. Do you have a source? Love your photo. Hello! Your blog is really interesting and I would love if you could help me in making the dreams come true for a student trying to earn their A&P! They had even removed the spin boldface and made it merely a "procedure." Martin, did you ever get your video? Posting such sensitive Top Secret military aircraft information can help our enemies and result in imprisonment. Unless of course you bypass government encrypted software and use your own homebrew router. In that case, carry on old boy.